"The Bluffs" redirects here. For area of Atlanta, see The Bluff (Atlanta). The Scarborough Bluffs seen from Bluffers Park. The Scarborough Bluffs, also known as The Bluffs, is an escarpment in the Scarborough district of Toronto, Ontario, Canada. There are nine parks along the bluffs, with Bluffers Park being the only one with a beach. Forming much of the eastern portion of Toronto's waterfront, the Scarborough Bluffs stands above the shoreline of Lake Ontario. At its highest point, the escarpment rises 90 metres (300 ft) above the coastline and spans a length of 15 kilometres (9.3 mi). The Scarborough Bluffs previously extend further along the coast of Lake Ontario, but its western fringe were leveled by explosives to make way for urban development. The French gave the name "Les grands Ecores", or tall points on the shore, to the cliffs. In the 1788 Plan of Toronto by Alexander Aitken, the bluffs were simply known as the High Lands. They became known as the Scarborough Highlands in 1793 named after Scarborough, North Yorkshire. This name was chosen by Elizabeth Simcoe, who was the wife of the first lieutenant governor of Upper Canada, John Graves Simcoe. The escarpment along Lake Ontario reminded Elizabeth Simcoe of the limestone cliffs in her hometown. In her diary, she wrote, "The shore is extremely bold, and has the appearance of chalk cliffs, but I believe they are only white sand. They appeared so well that we talked of building a summer residence there and calling it Scarborough." The name was later given to the entire township in 1796. In time, the cliffs became known as the Bluffs. A stylized version of The Bluffs was incorporated into the design of the flag of the former city of Scarborough. The Scarborough Bluffs formerly extended further west along the coastline of Lake Ontario towards the Toronto Harbour, but extensive areas along the western fringe were leveled by the use of explosives for the implementation of primarily industrial and some residential urban development. Even the existing formation has and continues to shrink considerably decade after decade due to consistent and dramatic erosion. The Bluffs have become a community meeting place for people of all ages. It features various recreational hiking and walking trails, as well as picnic tables, fire pits, places to pitch a tent, parking lots, a restaurant, and a large marina with a boating club. The Bluffs run 15 kilometres (9.3 mi) from the foot of Victoria Park Avenue in the west to the mouth of Highland Creek in the east, reaching as high as 90 metres (300 ft)— the equivalent of twenty-five storeys. However, the escarpment continues westward inland, running between Kingston Road and Queen Street East, pausing over the Don Valley, and continuing on the north side of Davenport Road. The escarpment forms part of the old shoreline of Glacial Lake Iroquois, formed after the last ice age, which left valuable geological records as the part of the escarpment by the lake eroded. The eroded alluvial deposits from the Bluffs then settled westward to form the Toronto Islands. Panoramic view of the Scarborough Bluffs and Lake Ontario from the base. Erosion is a major issue in the preservation of the Scarborough Bluffs. The Scarborough Bluffs have been eroding at a rapid rate since residences have been built along the lake bluff tops. The million-dollar views have been prime real estate since the 1940s. The desire for a beautiful lakeside view and an affluent lifestyle led to a real estate boom along the Bluffs—this resulted in a direct correlation of the accelerating rate of erosion . The eroding Bluffs have resulted in damaged private property and the need for public assets to be spend on repairs and corrective action . In summer 2008, chunks of the Bluffs had eroded to the point that one quarter of a cottage that the late actor and comedian Billy Van once owned, was left hanging on the cliff—the cottage was deemed a safety hazard by Toronto city officials as a result. This unfortunately is one of the many current and potential losses of properties, and the case for remedial shoreline protection is clear. To combat erosion, boulders acting as armor, rocks, and trees were placed at the base. However, to place these rocks and trees, a beach must be created to allow trucks to access the cliff base which would involve leveling parts of the Bluffs, such as the aforementioned Bluffer's Park. 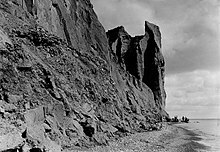 The Cathedral Bluffs, which is an impressive portion of the Bluffs, was the result of continued erosion.. Currently, to combat erosion and to make the area safe and more accessible, The Toronto Region Conservation Authority has created the Scarborough Waterfront Project which aims to revamp about 11 kilometers of Scarborough Bluff's shoreline. View from atop the Scarborough Bluffs at Bluffers Park. The Bluffer's Park Yacht Club is visible to the left. Guild Park and Gardens is one many municipal parks located around the Scarborough Bluffs. A number of city parks are located along the bluffs from Victoria Park Avenue to Rouge River. Most are located on the top the bluffs, but some are located at the base along the shoreline with Lake Ontario. Development of parkland began with the then Borough of Scarborough prior to 1960, while some remained in private hands. From 1960 to 1978 the parks were acquired by the Toronto and Region Conservation Authority which developed into today's current parks. Outside of the parks, many sections of the bluffs are on private property. Scarboro Crescent Park- located on Cecil Crescent and due west of Bluffer's Park. Park located on top of bluffs with no access to the water; formerly known as Scarborough Bluffs Park the City of Toronto renamed it as Scarboro Crescent Park to discourage users from attempting to climb down from the location. ^ a b Fairburn 2013. ^ Hayes 2008, p. 16. ^ Carter, Chris (October 6, 2005). "A holiday with history". toronto.com. Archived from the original on April 10, 2010. Retrieved September 23, 2007. ^ "The Trip to York". Travels with Elizabeth Simcoe. Archives of Ontario. Archived from the original on August 2, 2007. Retrieved September 23, 2007. ^ Doolittle, Robyn. "Scarborough Bluffs residents left hanging." Thestar.com, 22 Aug. 2008, www.thestar.com/news/gta/2008/08/22/scarborough_bluffs_residents_left_hanging.html. ^ a b Eyles, N., et al. "Applied Sedimentology in an Urban Environment—the Case of Scarborough Bluffs, Ontario: Canada's Most Intractable Erosion Problem." Geoscience Canada 12.3 (1985). ^ Doolittle, Robyn. “Scarborough Bluffs residents left hanging.” Thestar.com, 22 Aug. 2008, www.thestar.com/news/gta/2008/08/22/scarborough_bluffs_residents_left_hanging.html. ^ Doolittle, Robyn (August 22, 2008). "Scarborough Bluffs residents left hanging". Toronto Star. Torstar. pp. A10. Retrieved August 23, 2008. ^ "Getting to Know the Scarborough Waterfront Project - The West Segment." Toronto and Region Conservation (TRCA), 7 July 2017, trca.ca/news/getting-know-scarborough-waterfront-project-west-segment/. ^ O'Keefe, Lara. "They're not bluffing. TRCA says heed the warning signs at Scarborough Bluffs or get a fine—Beach Metro Community News." Beach Metro Community News, 21 June 2017, www.beachmetro.com/2017/06/21/theyre-not-bluffing-trca-says-heed-warning-signs-scarborough-bluffs-get-fine/. ^ Fox, Chris (May 2, 2017). "Scarborough Bluffs Park renamed to avoid confusion with nearby beach". cp24.com. ^ "Scarborough Bluffs Community Association". ScarboroughBluffs.ca. ^ "Guildwood Village Community Association". guildwood.on.ca. Hayes, Derek (2008). Historical Atlas of Toronto. Toronto, Ontario: Douglas & McIntyre. Fairburn, M. Jane (2013). Along the Shore: Rediscovering Toronto's Waterfront Heritage. ECW Press. ISBN 9781770410992. Wikimedia Commons has media related to Scarborough Bluffs.